ArabLit: Why experimental works? What role do you think experimental and avant garde works play in the literary arts? Locally, regionally, globally? Mirene Arsanios: Experimental work is a broad term. I understand it, in the context of Makhzin, as writing that doesn’t fit into a genre, be it poetry, fiction, or creative non-fiction. What is important, in my opinion, is the sense of urgency that drives the writing. Having said that, Makhzin also publishes straightforward fiction and poetry. In the editorial process, rather than thinking traditional/ experimental, we looked for pieces that played with conventions, structures, and narrative voices. On a personal level, I was always “naturally” drawn towards experimental writing. I grew up speaking different languages, and never felt at “home” in any of them. Experimental writing often explores positions and voices that are not represented in mainstream literature (women writers, queers writers, writers who don’t write in their native language, or that simply don’t have one). Amira Hanafi witnesses the Egyptian revolution through her female body. Raed Rafei writes about a homosexual man forced to undergo a medical check up. Alex Cuff harvests her material from online forums on pubic hairstyles and ways of shaving. Writers are drawn to experiment with language when available forms seem obsolete, ossified and not fit to express their realities. But again, I would avoid a dogmatic reading of the experimental versus the traditional. Experimental writing can be so many things (so does conventional writing!) depending on your context, city, language. Makhzin also wants to juxtapose what a poet is writing in Morocco and what a poet is writing in NY. Sometimes their writings can be similar, sometimes not. But again, I would avoid a dogmatic reading of the experimental versus the traditional. Experimental writing can be so many things (so does conventional writing!) depending on your context, city, language. AL: How does this fit into 98weeks’ mission? MA: In 2010, 98weeks embarked on a research titled “On Publications,” which looked at the history of cultural and literary magazines in the Middle East. We had two focuses: Shi’r magazine and Al Hilal magazine. We also organized a book fair of independent publishers called “Why Do You Publish?” I was interested in publishing, its history and legacy, but also wanted to do something in the present. 98editions stemmed from that research project. We published fours individual chapbooks, which you can see on our website. After that experience, I felt the need to cultivate and broaden our readership, hence Makhzin. 98editions developed into its own independent small press, but it also maintains a connection to 98weeks research. For instance, 98editions will develop two publications around 98weeks’ current research theme, Feminisms. AL: How did the three guest editors work with you, with each other? Why did you choose them? Did you give them particular instructions? MA: The editors are friends and people I admire for their work with language and writing. Ghalya Saadawi is herself an editor and a writer. Omar Berrada is a translator and a writer working with literature and art. Lara Khaldi is a curator. I wanted people who were steeped in both art and literature. There were no instructions per se. We all live in different countries so most of the selection process was carried via (long!) Skype meetings. We had different rounds before agreeing on our final selection. Omar and Lara did most of the Arabic selection. We all did the English part, and Omar, Ghalya, and I discussed the French texts. AL: Were you looking to push boundaries / “red lines,” or did it just happen that way? MA: There was no particular agenda in terms of pushing boundaries or crossing lines. 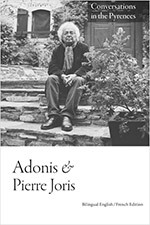 But since the editors all have an interdisciplinary background (art, literature, curating, theory), the selection was perhaps more flexible, and the outcome more varied then it would be in a strictly literary or artistic magazine. AL: There is a tradition of multilingual publications in Beirut. How do you decide the balance of languages? Or does it just depend on what you receive? Why Wajdi al-Ahdal in translation instead of in Arabic? MA: The balance of language depended on what we received. Percentage wise, most writings are in English, then Arabic, and lastly, French. Concerning Wajdi al-Ahdal; I invited Nada Ghosn, a translator from Arabic to French, to submit a piece for Makhzin. She proposed to translate a short story by Wadji al-Ahdal. I often encounter or discover texts through a translation. While keeping a connection to the original, Nada’s translation also becomes its own text. I often encounter or discover texts through a translation. While keeping a connection to the original, Nada’s translation also becomes its own text. AL: How will you be distributing Makhzin? Why print? MA: Part of what prompted the creation of 98editions is an interest in chapbook culture, printed matter, and its circulation in a community of readers (global and local). All 98editions publications are designed by Karine Wehbé. Our first four publications each have their own format, developed in close collaboration with the authors. We wanted to insist on the specificity and singularity of each book. 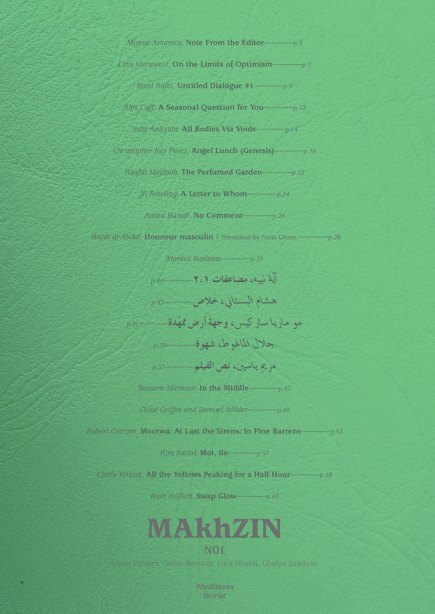 We distribute Makhzin in Beirut in bookshops and art spaces; 98weeks, Papercup, Bourj Library, BAC, Ashkal Alwan. Shortly, people will be able to order our publications on line. AL: Are you accepting submissions for N02?